When Fox decided to premiere the pilot of its new show Touch two months ago, it was an odd way for the network to debut its newest drama. Airing your pilot separate from the rest of the series can be a way to build excitement for your upcoming show, but after watching the show’s second episode “1+1=3”, it seems more likely that Fox was trying to have some distance between Touch’s promising debut and its incredibly familiar yet much weaker follow-up episode. 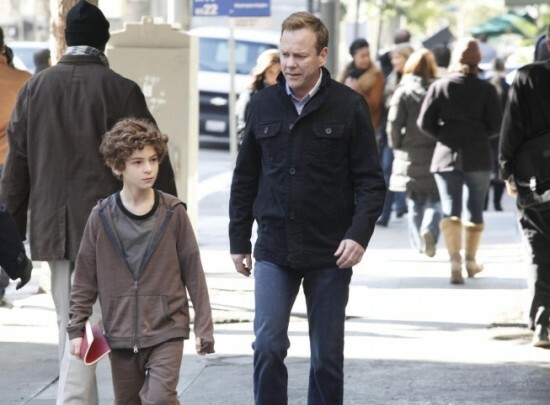 After the pilot, which featured people from all over the world being connected because of Jake, a mute boy who connects people via numbers, Touch decides to mostly scale it down to the Los Angeles area for the second episode. Jake’s father Martin now believes that Jake can see the future by using numbers to see the past and present of other people, so Martin is now ready and willing to accept instructions from Jake regardless of the cost. This time Jake writes a phone number, which Martin tracks down to a pawnshop. When he enters, the owner Arnie seems ready for a stick-up. A few seconds later, a man in a mask comes in to rob the place and beats up Martin. We later find out Arnie has cancer and hired the criminal to come in to rob him and shoot him. The criminal escapes since things didn’t go as planned and takes a baseball with him. Here’s where things get complicated and quite ludicrous. Martin works at an airport and loses a dog that a stewardess is supposed to make sure gets on a plane. After a rough day, the stewardess runs into an Indian boy who is carrying his father’s ashes. Since she caused the boy to spill some of the ashes, she decides to help the guy spread his father’s ashes at a baseball field. Meanwhile, the criminal owes money to the Russian mafia and tries to give them the baseball, which he had previously sold to the pawnshop. The head of the mafia says that he still has to get him his money. The criminal heads to the baseball field to give back the baseball to the player who hit it, since it turns out catching the ball changed the outcome of the game. The criminal leaves to find the mafia outside waiting for him. Meanwhile in Russia, the head mobster’s son finds out that he has no friends because his father is such a horrifying man. The son calls the father to question him about this, leaving the mobster to have a change of heart, letting the criminal go. The criminal leaving the field left the door open, which allows the Indian boy who hadn’t made any plans to sneak right in. Also, his stewardess companion sees the dog she lost once they arrive at the stadium and chases after it. Confusing? Somewhat. Ridiculous? Even more so. Martin eventually finds Arnie on a bridge, ready to jump since he has no one who loves him. His daughter won’t even talk to him. All of a sudden, the missing dog appears, leading the stewardess behind him. And guess what? She’s Arnie’s long-lost daughter. The episode wraps up all the continuing storylines in such a cheesy way, it could make the writers of Touched By An Angel puke. If that’s not bad enough, Martin has a one-on-one talk with Jake, saying that as the father he should be teaching Jake, but now Jake is teaching him instead. Ugh. The inherent idea of the show is just flawed. Why does some number that pops into Jake’s head lead to a Russian mobster’s son learning why he doesn’t have any friends? Sure, it is a take on the whole butterfly effect idea, but the way it is handled is completely sloppy. Also, doesn’t the idea of Jake making his father intervene in these actions automatically mess with the order of things? Maybe his interactions are also in the numbers. Touch already feels like it is repeating itself. We once again get Jake disappearing, leaving Martin to search the city for his mute son. From what I can grasp, “1+1=3” is supposed to take place the day after the pilot, and Martin already has complete faith in the actions of his son? Plus that means in two days, Martin has been on the losing end of two fights. It almost feels like a cry for Kiefer Sutherland to lose his badass image he maintained for almost a decade on 24. In the pilot, Touch had a unique way of telling connecting stories, but it still felt like a difficult way to launch a series. “1+1=3” cements all the worst fears about what Touch could become after that first episode. The ideas here are ridiculously cheesy, and the way everything ties together with a nice little bow around it is actually frustrating. It seems like Touch is already struggling to combine story ideas and engaging characters into an hour, and the show has no real sense of tension since it seems like Jake’s plan can have no flaws. I don’t know how Touch can maintain its ideas in a consistently enthralling show, but “1+1=3” is definitely not the way to do it.